President Muhammadu Buhari yesterday undertook a self-appraisal of his administration since he assumed office on May 29, 2015 and concluded that he had delivered on all his electioneering promises to Nigerians. Buhari stated emphatically that he had not betrayed the citizens on the promises he made to them almost four years ago. The president spoke yesterday in Ado Ekiti, the Ekiti State capital when the All Progressives Congress (APC) supporters thronged the 12,000-seat capacity Ekiti Parapo Pavilion, venue of the APC presidential campaign rally. He told the crowd that fighting corruption in a country like Nigeria was not an easy task, and quickly assured them that there was no going back on his resolve to rid the country of the menace as he promised in 2015. Buhari said that the APC-led federal government had kept the promises it made with Nigerians when it came to power about four years ago by touching on critical sectors which had impacted positively on Nigerians. The APC presidential candidate said that he was conscious of the promises he made while contesting four years ago, particularly the ones that had to do with corruption, insecurity and economic diversification. He said: "All of our achievements have been highlighted earlier by our party leaders. We were very conscious of the promises we made when we were coming in 2015. "We are fighting corruption but it has not been easy. But we told the security agencies to keep tab on those on our watch list and ensure that no stone is left unturned to ensuring that those who have cases to answer do not escape justice. "As part of our promises, we are building roads, rail lines, fighting corruption. The importation of rice was stopped to encourage local production. We introduced Treasury Single Account (TSA) and increased power supply so that Nigerians can have electricity power to do their businesses under a conducive atmosphere. "I am grateful to Ekiti State votersbecause the two times I came here, I achieved successes. I came here in 2014 and I also came here to campaign for Kayode Fayemi, he won the governorship election, so I thank you," Buhari said. Dignitaries at the rally included Vice President Yemi Osinbajo, governors Kayode Fayemi (Ekiti), Gboyega Oyetola (Osun), Abiola Ajimobi (Oyo), Rotimi Akeredolu(Ondo), Ibikule Amosun(Ogun), former APC interim national chairman, Chief Bisi Akande, Mr. Olusola Oke, the minister of Transportation, Rotimi Amaechi among others. Some members of the Ekiti State House of Assembly and chieftains of the Peoples Democratic Party (PDP) defected to the APC at the rally. The lawmakers, who were led by the Speaker , Hon. Ebenezer Alagbada were Cecelia Dada representing Ilejemeje constituency and Olanrewaju Olayanju from Emure constituency. At a meeting with Ekiti monarchs, Buhari pleaded with them to support his re-election bid and the state government for sustainable peace in Ekiti State and beyond. Osinbajo also told the mammoth crowd that "the sum of $383 billion was gotten from the oil between 2010 and 2014. That was when we had the highest of such, but nothing was done with it. "If that money had been utilised judiciously, all the roads, rail lines and employment we are creating would have long been in place for Nigerians. "Don't let them deceive you, vote for a president you can trust, that is President Buhari," he advised. APC national chairman, Adams Oshiomhole, said that it would be a big mistake if Nigerians elect the PDP presidential candidate, Alhaji Abubakar Atiku, in the February 16 poll. Oshiomhole, who received defectors to the party, said Atiku owes Nigerians explanation over alleged stealing of millions of dollars belonging to Petroleum Technology Development Fund (PTDF) which he superintended over during the administration of former President Olusegun Obasanjo. APC national leader, Asiwaju Bola Ahmed Tinubu, Afenifere leader, Senator Ayo Fasanmi and former Osun State Governor, Chief Bisi Akande, described the Reuben Fasoranti-led faction of the group, which endorsed Atiku as political jobbers, who shouldn't be taken seriously. Fayemi promised that "our president will get 90 per cent of the votes that would be cast on February 16." While in Akure, the Ondo State capital yesterday, Buhari said that he would take more drastic actions to secure Nigeria if elected for a second term in office. He made the promise at the APC presidential campaign rally held at the MKO Democracy Park in the state capital. The president said that his APC-led government had provided security for the country and fought the scourge of corruption. According to him, Boko Haram has been decimated mostly in the Northeast, noting that the recent attacks by the group were aimed at soft targets. In the same vein, Osinbajo urged the people to cast their vote for the APC in order to benefit more from the dividends of democracy under the Buhari administration. The vice president said that the APC government has kept to its promises by ensuring that the poor Nigerians no longer go to the bed in hunger. Osinbajo further disclosed that Buhari was concerned on the issue of electricity and has restored power supply to some parts of Ondo State which were formally in total blackout. He promised that the government would bring railway project to Akure to boost the state's economy and asked the people to vote for Buhari again. Oshimhole asserted that Buhari is capable of taking the country to the "next level" compared to the PDP candidate. For his part, APC national leader, Bola Tinubu said that Southwest leaders believe in Buhari and would ensure his return to office. Engr. Ade Adetimehin, APC chairman Ondo State said that the party is ready to deliver votes for Buhari in next week's election. Also, Amaechi, the director-general of APC Presidential Campaign Council, urged members of the party to unite in ensuring that Buhari returns to power again. Governor Rotimi Akeredolu of Ondo State assured Buhari that the people of the state would vote massively for him. Akeredolu added that Buhari would be convinced by the "handsome votes" that the state would garner for him. Meanwhile, the Senate President, Dr. Abubakar Bukola Saraki, has said that the gale of endorsements of Atiku reflected the wishes of the electorate. Saraki, who is the director-general of the PDP Presidential Campaign Council, described the endorsement as a validation of the results of the scientific polls by the London Economist intelligence Unit and the William and Associates team. In a press statement he issued yesterday, Saraki said that with the latest developments, Nigerians had taken a position that the false claim of integrity and anti-corruption fight by Buhari was nothing but an election gimmick. The Senate president stated that the three major pillars - economy, security, and anti-corruption - which Buhari hinged the campaign for his reelection on, had collapsed in the face of realities on the ground. Saraki said: "The economy has been thoroughly mismanaged. Insecurity has become more widespread and beyond their control while the government encourages and nurtures corruption from within." He also expressed confidence that Atiku would win the election in a free and fair contest based on the scientific forecasts by the two groups and the evident massive nationwide support for Atiku by Nigerian electorate. Saraki therefore urged Nigerians to take a cue from the gale of endorsements and predictions by credible groups in favour of Atiku and vote wisely. "The endorsements are like tonic to the work of the campaign organisations to intensify our efforts as it is a testament that we are employing the right approach and techniques to market our candidate to Nigerians. "We have been able to change the narratives. We have debunked a lot of lies and rumours being peddled around against our candidate and Nigerians are now better informed. "Leaders of the ruling party know that they could no longer deceive Nigerians because we have allowed the people to know that they are all pretenders with their claim of integrity and anti-corruption posture. "The fact that Nigerians expressed favourable opinions while credible private agencies were conducting their research showed that Alhaji Atiku Abubakar, will defeat the incumbent, President Buhari, Saturday next week," the Senate president stated. In another dimension, the ruling APC has urged the police and the Independent National Electoral Commission (INEC) not to allow the opposition Peoples Democratic Party (PDP) to stampede it with its criticisms. 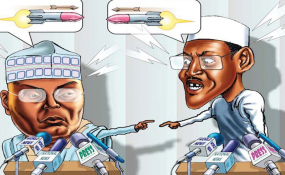 The opposition PDP had accused the INEC and the security agencies of working in tandem with APC to rig the election. But, in its reaction, the APC said that the PDP and Atiku should rather address its floundering campaign and corruption baggage over it. In a statement by its national publicity secretary, Mallam Lanre Issa-Onilu, the APC asked the opposition party to stop overheating the polity, claiming that the PDP had elevated falsehood and crying wolf into an ignoble art in its campaign. He said: "We urged INEC and other state institutions responsible for different election duties to remain firm and focused in the discharge of their legitimate roles. They must not be stampeded into taking actions that run contrary to the constitution and the Electoral Act." Issa-Onilu added: "Nigerians have also watched in disbelief how the PDP without proof has consistently and vehemently pilloried state institutions performing various roles in the coming general elections. "From security agencies to our election management body, the PDP has spared none its barefaced lies. On a daily basis, the PDP has invented one lie after the other to discredit state institutions in the eyes of Nigerians and the international community. PDP's ignoble actions are unhealthy for our electoral processes and a threat to our maturing democracy," he said.